It’s Sunday morning and there’s a thunderstorm outside. I have a lot of work to do today to prepare for the week, so I decided to treat myself to breakfast in bed!. 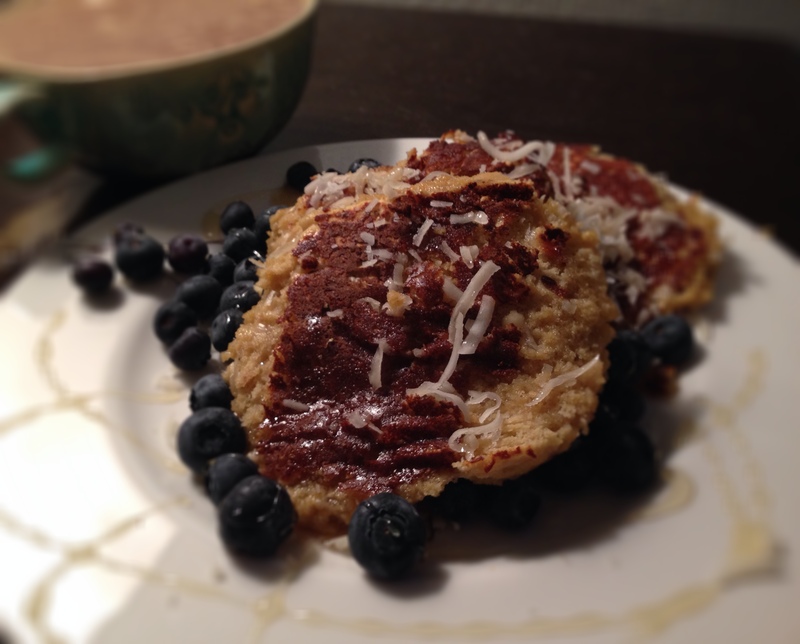 I found this amazing paleo pancake recipe on Eat Drink Paleo and it was love at first sight! I paired it with a latte made with stevia and coconut milk too. It’s a coconut kinda morning! Now THIS is a great way to start your day – rainy or not! Place all ingredients in a blender and puree until smooth and fluffy. If you don’t have a blender, you can mash banana with a fork and whisk the eggs in a bowl and then combine with the rest of ingredients. Heat your pan and spray with coconut oil spray or add a dollop of coconut oil into a non-stick frying pan. Cook pancakes in batches, about one and a half tablespoon of mixture per pancake. Keep the heat on medium making sure the pancakes don’t burn too quickly and cook thoroughly. You know it’s time to turn them over when little bubbles start appearing in the batter. My batter turned out a bit thick so I just let them cook about 2 min each side then flipped them, you may choose to make them a little thinner than mine. The batter is quite fragile so use two spatulas to turn them over. Add a little more spray or coconut oil in between pancakes. Serve with lemon butter or maple syrup and berries and a sprinkle of coconut on top.